Eternal Orthodox Church calendar for the 09.11 year 2017. 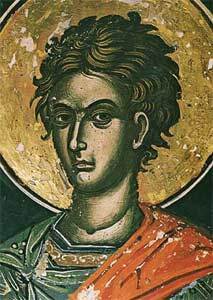 At the time of the martyrdom of St Dimitrios the Outpourer of Myrrh, there was in Constantinople a young man, Nestor, who had learned the Christian faith from St Dimitrios himself. At that time, the Emperor Maximian, an opponent of Christ, ordered various games and amusements for the people. The Emperor"s favourite was a Vandal called Lyaeus, a man of Goliath-like size and strength. As the imperial gladiator, Lyaeus challenged men every day to a duel and slew them, and this blood-letting of his delighted the blood-lust of the idolatrous Emperor. He built a special arena, like a terrace on pillars, for Lyaeus"s duels. Underneath this terrace were planted spears with sharp cutting-edges pointing upwards. When Lyaeus had overcome someone in the duel, he would push him from the terrace above onto the whole forest of prepared spears. The pagans stood around with their Emperor, and were delighted when some poor wretch writhed in torment on the spears until he died. Among Lyaeus"s innocent victims were a large number of Christians, for, when there was a day when no-one came forward voluntarily to duel with Lyaeus, then, by the Emperor"s orders, Christians were compelled to fight with him. Seeing this horrifying enjoyment of the pagan world, Nestor"s heart swelled with pain and he resolved to go himself to the arena of the gigantic Lyaeus. He first went to the prison where St Dimitrios was kept, and asked his blessing to do this. 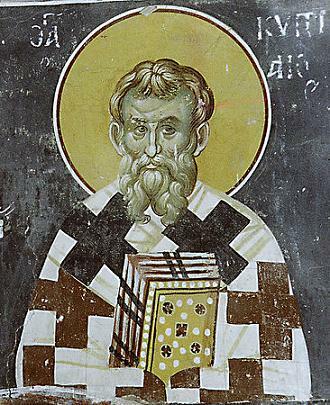 St Dimitrios blessed him, signed him with the sign of the Cross on forehead and breast, and said to him: "You will overcome him, but you will suffer for Christ." The young Nestor then went to Lyaeus"s arena. The Emperor was there with a large crowd, and they all bewailed the probable death of the young Nestor, trying to dissuade him from fighting Lyaeus, but Nestor crossed himself and said: "O God of Dimitrios, help me!" 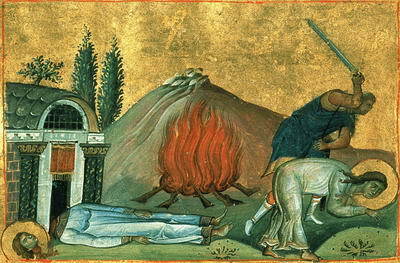 With God"s help, Nestor overcame Lyaeus, felled him and threw him down onto the sharp spears, where the heavy giant soon found death. Then the whole people shouted: "Great is the God of Dimitrios!" But the Emperor had lost face before the people, and, mourning his favourite, became filled with wrath against Nestor and Dimitrios, and the wicked Emperor ordered that Nestor be beheaded with the sword and Dimitrios run through with spears. Thus this glorious Christian hero, Nestor, left behind his young, earthly life in 306, and entered into the Kingdom of his Lord. 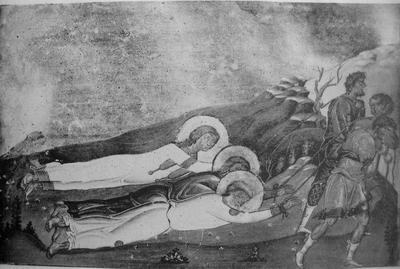 He arrived at the Monastery of the Caves in Kiev at the age of seventeen, while St Theodosius was still abbot. He wrote the first history of the Russian people, into which he interwove the history of Russian asceticism. He was distinguished by a rare humility and meekness. In his glorious literary works, he often refers to himself as unworthy, vulgar, ignorant and filled with every sin. But God, who knows the heart of man, glorified this wonderful man who was so pleasing to Him. 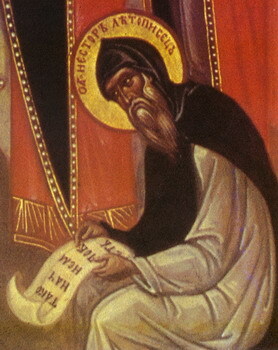 When Nestor entered into rest, on October 27th, 1114, his relics performed many miracles.